Compact cars have long had very few expectations other than being practical, reliable, and economical transportation. 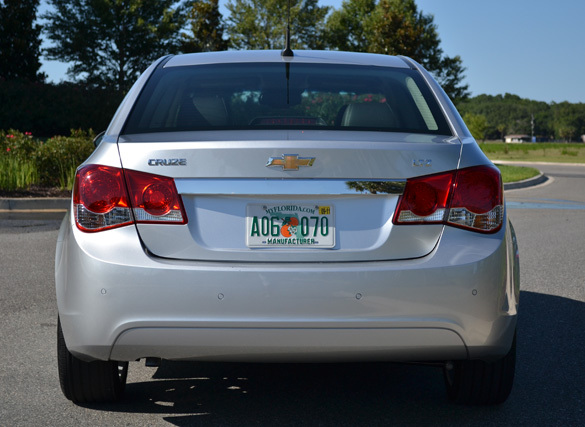 The new 2011 Chevy Cruze attempts to redefine the compact car segment, aiming a bit higher to accommodate growing households with a vehicle that slightly merges into the midsized car category. 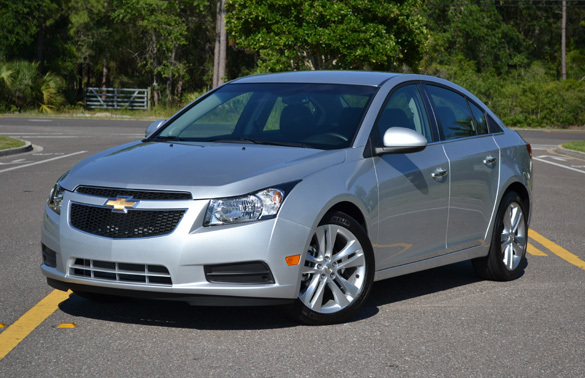 The all-new 2011 Chevy Cruze comes in many flavors starting with a base LS trim starting at just $16,525. The LS Cruze gets you a more conservative style with a 1.8-liter 4-cylinder engine that produces 136 horsepower and 123 ft-lbs. of torque. Fuel consumption is rated at 26mpg city and 36mpg highway for the 1.8-liter. 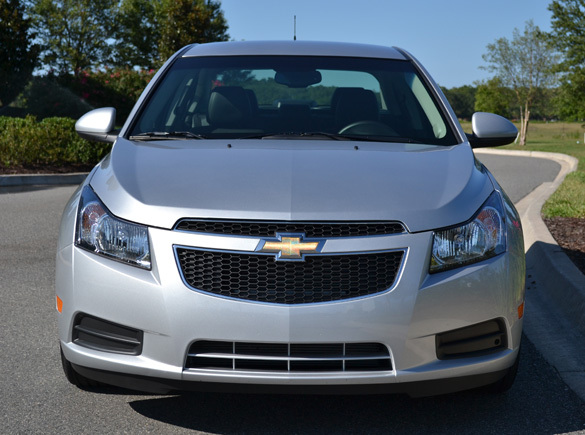 From there the Cruze can be had in Eco, LT or LTZ model trims which opts for a smaller but more powerful 1.4-liter 4-cyl turbocharged engine over the base LS trim found in my top-of-the-line Cruze LTZ test vehicle. The Cruze Eco model is virtually a LS trim but optimized for better fuel efficiency with reduced body weight, lightweight alloy wheels, low rolling resistance tires, and aerodynamic improvements thanks to the unique front shutter system which automatically closes at speed to change the geometry of air travel. 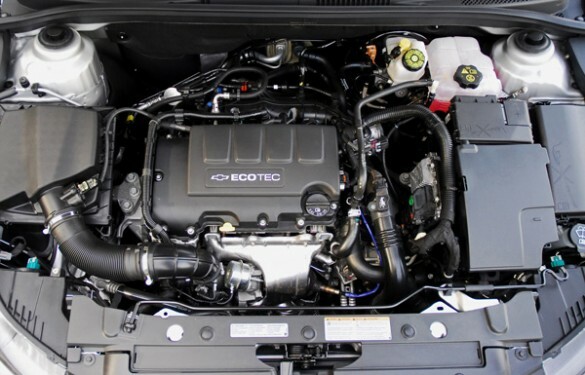 The Eco model, with all of these changes, is able to get an astonishing 28mpg city and 42mpg highway. The conservative styling of the new Cruze is very tasteful without any boring frumpiness that may be found in a new Corolla. Chevrolet has done a great job making the Cruze contemporary but not boring in any since of what you get with other compact cars on the market. In other words, you don’t need some tricked-out dealer-installed body kit to make your new compact car look “attractive”. My test Cruze LTZ model is quite peppy thanks to the forced induction of the 1.4-liter engine with double-continuously variable cam phasers for the intake and exhaust. The quant 4-cylinder actually performs like a bigger engine when power is demanded, yet retains its excellent fuel economy. The new Cruze is probably among more athletic vehicles in the compact segment, especially with my LTZ trimmed test vehicle being equipped with 225/45 W-rated rubber wrapped around 18-inch alloy wheels. The wheels and tires not only help for performance but they make the Cruze look more appealing when compared to the competition. During my time in the new Cruze LTZ it felt as if I was driving a mild-mannered compact sports car, especially when the surge of torque would kick in around 2000 rpm. 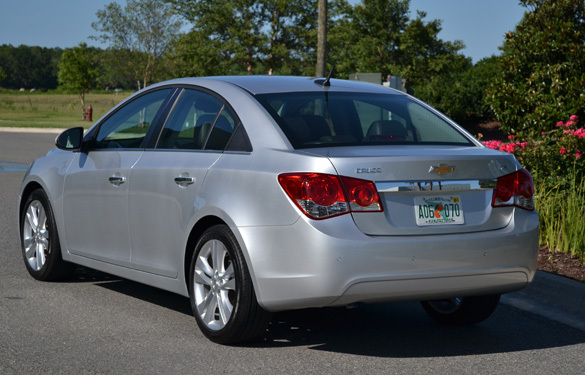 Around town the Cruze LTZ handles its own very well in most situations. 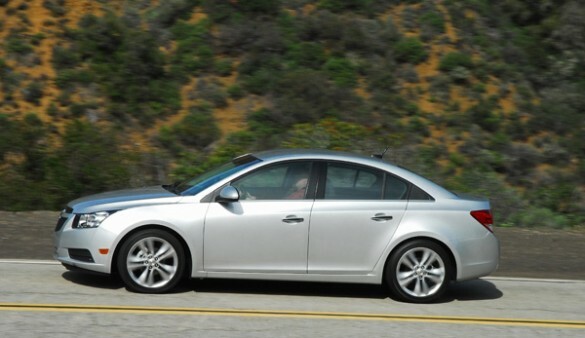 During highway driving the Cruze LTZ can actually get away from you due to its well-insulated quiet cabin. This is something thought to be not so expected in a compact sedan. Chevrolet has done an excellent job in designing a compact sedan that rivals with some vehicles in the midsized segment. 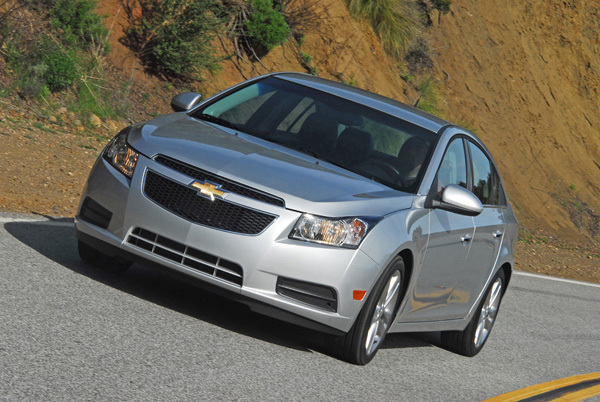 Much of the new Cruze’s power delivery in an economical fashion is due to its 6-speed automatic transmission. A manual transmission comes standard on the LS and Eco trim levels while the LT, and my LTZ test vehicle came with the 6-speed auto as standard equipment. The automatic mill attempts to keep the engine’s narrow power band in the optimal rpm range. Shifts come on smooth and somewhat sluggish at times but never consistently hunting for the correct gear. The new Cruze has many European characteristics being that it was built off of the same platform as the Opel Astra. This is a common trait that seems to be working well for General Motors and it shows in cars like the Cruze and even the new Buick Regal that we tested several months ago. 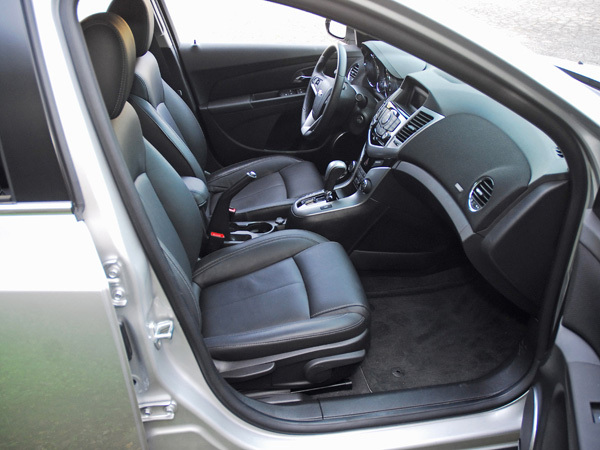 Inside the new 2011 Cruze LTZ you will find a well laid out interior that gives off an air of quality in its materials. 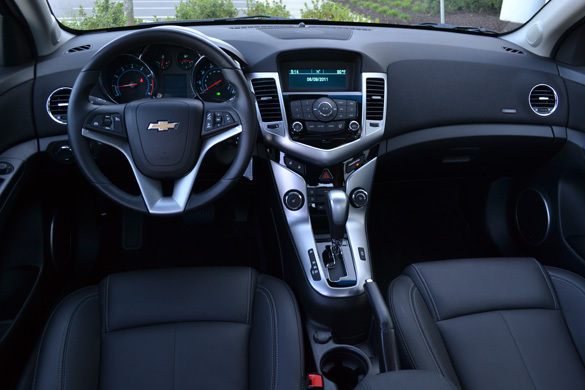 Chevrolet used a fabric for the dashboard trim that nicely integrates the cabin to give it a cozy feeling. 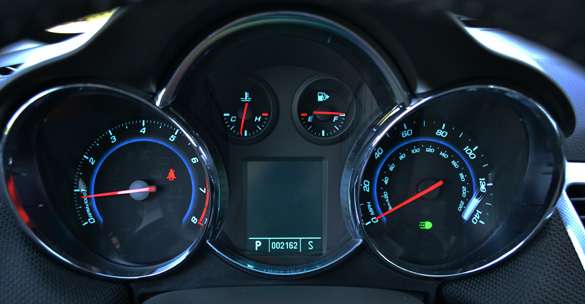 The instrument cluster is big, clear and well lit with LED backlighting during the night. One of the major drawbacks of the Cruze LTZ’s interior are the seats. Even though the front has heated bucket leather seats, they become rather uncomfortable after about 30 minutes of driving. The seat padding seems to be on the thin side as it is in the low sitting rear seating area. 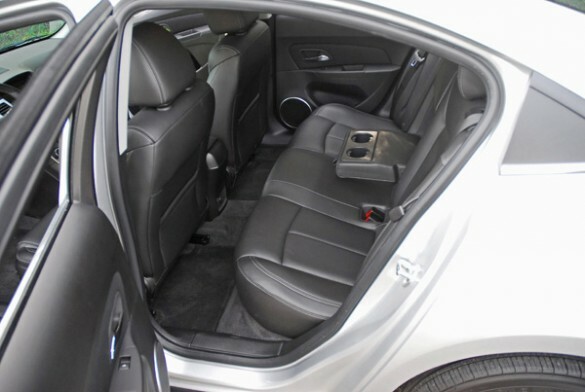 Nevertheless, the front seats have plenty of travel allowing those slightly over 6-feet tall to find a comfortable position provided they don’t sit for longer than 45 minutes. Moving the front seats fully aft will virtually eliminate any rear-seat legroom. All of the controls are placed in the most favorable position with the exception of the HVAC controls. Since I am just over 6-feet tall, I found my knee doing more adjusting of the A/C temp than my hands. The A/C controls are mounted a bit too low and to the side of the center console for my liking. Although, the remote-start made-up for this blunder in our 96+ degree Florida weather, by activating the A/C which would cool things off before entering the vehicle. You would think practicality is a given when it comes to economical compact cars. Sure, that may be the case with some compacts but there are few that do not live up to that expectation. 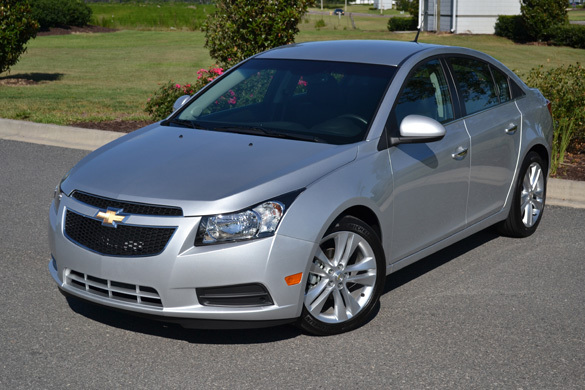 The Cruze, on the other hand, takes practicality to a new level venturing into a land where other economical mid-sized cars dominated the field, which Chevrolet did not go many years ago. The Cruze, despite its size on paper, can fill the void of some mid-sized cars and that says a lot about the design and development put into Chevrolets newest compact car. 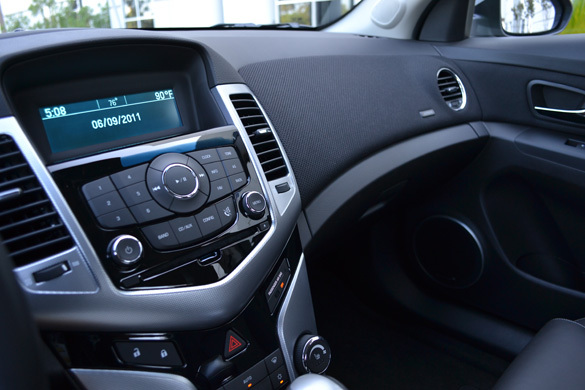 Several of the expected creature comforts can be had on all Cruze trim levels such as Bluetooth, Satellite radio, MP3 player, OnStar, and even a Navigation system on the LT or LTZ trims. My 2011 Cruze LTZ was well equipped with color-keyed power sideview mirrors, floor mats, one-touch-up driver’s window, 18-inch alloy wheels, remote vehicle start, cruise control, leather upholstery, heated front seats, six-way power driver seat, steering-wheel-mounted audio controls, a USB/iPod port for the audio system, Bluetooth, automatic climate control, an auto-dimming rearview mirror, illuminated vanity mirrors, four-wheel disc brakes with ABS, rear park assist, and sport-tuned suspension. It had virtually every option except the navigation system yielding a price of just $23,240. Potential buyers won’t even remember the outgoing Cobalt, which the Cruze replaces, because there is so much here to offer in the all-new 2011 Chevrolet Cruze.